LA VETA — The La Veta Library is the place to be Thursday, April 11, 2 pm for an enlightened book discussion led on Sam Law on “Unsheltered” by Barbara Kingsolver. This best selling book is the story of two families, at the same New Jersey location in different centuries, navigating what seems to be the end of the world as they know it. 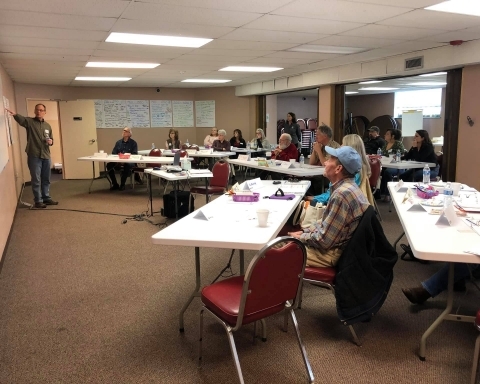 WALSENBURG — Huerfano County Farm Bureau presents an opioid panel presentation and discussion tonight, Thursday, April 11, 6 pm at the Washington School Auditorium. The discussion will include, but is not limited to: How to help a friend or family member through recovery; Ways to help yourself cope when a friend or family member is going through addiction; Programs in Colorado small towns that have had an impact; What is available locally now; &… What could be done in the future. EVERYONE IS INVITED TO ATTEND! WALSENBURG — The next Navajo HOA Board Meeting will be held Thursday, April 11, 6:30 pm. The next membership meeting will be held Monday, April 15, 7 pm. Both meetings will be held at the Navajo Western Water District office. LA VETA — Join us at Family Game Night Thursday, April 11, 6 pm! Come down to La Veta Mercantile the second Thursday of each month through April, and have some fun. Beer, wine, soda, coffee, snacks, music, and GAMES!! Fight that boredom and join your neighbors for Board Games with our fearless leader, John Costea. Support our local merchants this spring… we all need each other! LA VETA — La Veta Preschool and children new to La Veta Schools entering Kindergarten will be screened Friday, April 12, 9 am to 1 pm by appointment. Screenings will be for fine/gross motor skills, speech/language development, vision and hearing, and preschool well-child checkup provided by Spanish Peaks Regional Health Clinic. Screenings will be by appointment only, please call the La Veta Elementary office at 742-6417 to schedule. Please allow 2 hours to complete the process. Participation in this screening does not guarantee enrollment in La Veta Schools. Students must be 4 years old by June 1. In-district children have prioritized registration privileges, all incoming preschoolers and new kindergarten students to the district need to bring birth certificate, immunization records, and insurance information the day of the screening. LA VETA — Come get some Pub Grub, and listen to some very talented musicians known as our beloved Celtic Orphans on the next Pub Night, Friday, April 12, 6 to 8 pm. Enjoy some adult beverages, soda, tea and coffee, as well as snackage in a package. Truly incredible artists and it’s FREE!! WALSENBURG — The City of Walsenburg will be conducting a five minute test of the newly-installed flash flood warning siren at 10 am this Saturday, April 13. Walsenburg Mayor Dennis Hoyt says the siren will only be tested once, so that residents don’t become accustomed to false- alarm tests and recognize the urgency of the siren when it blares. A 100-year flood event is likely within the next six years, according to Huerfano County Administrator John Galusha, potentially damaging or destroying as many as 670 homes and dozens of businesses within city limits. WALSENBURG — Wear your oldest clothes, paint stains and all, to the Empty Pockets Dinner Saturday, April 13, 6 pm after you have paid your taxes. One in a series of community dinners, this one celebrates finishing (we hope) your tax forms and you are left with empty pockets. Dinner and live music starts at 6 pm in the United Church, 108 Kansas. Use the handicap door, the one opposite Loaf ‘n Jug. Also empty your pockets of any remaining pennies; we will collect pennies in tin cups to donate to Dorcas Circle. For the dinner we ask for donations to cover the cost of the food – beans, cornbread, green chili, tortillas, dessert, and drinks. There will be lots of visiting and fun along with the music. LA VETA — Ken Saydak and Tom Munch are back again Saturday, April 13, 7 to 9 pm at the Merc! What do you get when you cross the mellow, melodious musical mosaic that is Tom Munch with the blues-soaked crunch of Ken Saydak’s urban Americana? Come find out! Join us for a slightly sweet, some-what nutty evening of music, where two of our areas most prolific performers find common ground in the music of America. Tickets are $18 in advance or $20 at the door. CUCHARA — Services are held at 10 am every Sunday at the Cuchara Chapel, located just south of Cuchara Village on Hwy 12. Rev. Eileen Ramsey presides. All welcome, come as you are. ADA accessible. Special message, The Spiritual Power of Jerusalem, guest musician Tom Munch. WALSENBURG — New Hope Community Church of Walsenburg, 801 Pennsylvania, hosts a free pancake breakfast every Sunday at 9 am. A marijuana dependency recovery support group meets Sunday mornings at 11 am . LA VETA — An afternoon of poetry in honor of “The Wild” will be held Sunday, April 14, 3 to 5 pm at Tom Doerk’s home, 120 W. Grand. Bring poems to read (your own or other favor- ites!) For more information contact Tom (742-3776) or Robin (742-3398). 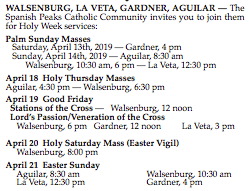 WALSENBURG/LA VETA — The Sangre De Cristo Vocal Arts Ensemble announces its Spring/Easter presentation, featuring a unique, powerful, and compelling Tenebrae Service, a reverential service recalling the events of Holy Week from Palm Sunday through the crucifixion and burial of Jesus. We will be presenting “It Is Finished” by Mary McDonald, at St. Mary’s Church in Walsenburg on Palm Sunday, April 14, 3 pm, and at the La Veta United Methodist Church on Maundy Thursday, April 18, at 6 pm. Please join us for this deep, solemn, and worshipful remembrance of the events of Holy Week – the darkness of the passion of Christ promising the glorious light of the Resurrection. Everyone is welcome. Again, we are ever grateful to Charlies Market for their generous donation of our sheet music. WALSENBURG — Come one come all to hear our award winning band and choir ensembles perform their CHSAA contest music for the 2019 season. door. All proceeds will go to fund music in our schools. Seating is limited. First come, first served, a night for the whole family to enjoy. Follow the band on Facebook, Huerfano Re-1 Music Department, and see all upcoming events online at bpollack7.wix.com/panthermusic. LA VETA/PUEBLO — Fagen Inc., a heavy industrial contractor is interviewing with the possibility of on-the-spot hiring for a wind farm construction project located in Walsenburg CO. Applicants are encouraged to bring resumes, but not required to the career fairs being held in La Veta at the La Veta Mercantile, 300 South Main Street, Tuesday April 16, 10 am to 3 pm or at Pueblo Workforce Center, 212 W 3rd St, Wednesday April 17, 10 am to 4 pm. These positions available: tower erectors, ironworkers, millwrights, concrete finishers, riggers, form carpenters, equip- ment operators, rodbuster, general laborers. If you cannot at- tend, go to www.fageninc.com to fill out an application. WALSENBURG — The American Legion Post 16 and American Legion Auxiliary Unit 16, will meet on Tuesday, April 16, 6:30 pm on the 2nd floor of the Spanish Peaks Veterans Community Living Center, 23500 US Highway 160. All Veterans and their spouses are invited to attend. We will be discussing current activities as well as any future activities. Come and join us! For further information, contact the Post Commander, Gary Baldwin at 719-738-2801. LA VETA — Join us as we welcome Robin Richards and her “Art and Biography” as she interviews and explores the wood sculpture and crafts of artist Michael Hoffer Thursday, April 18, 2 pm. Michael is new to our community, after spending 26 years in overseeing the fine woodworking department at Santa Fe Community College and running his own business, he has relocated here and plans to open his own woodwork gallery at the Parkside this Spring. Come and welcome Michael and see some of his beautiful creations! Brought to you by the Friends of LaVeta Library. This program is free with delicious refreshments! LA VETA — The high energy Celtic musical group from Ire- land, the High Kings, will be “giving” a virtual performance on Thursday, April 18, 7 pm at the La Veta Mercantile, 300 S. Main Street. The film, “The High Kings – Four Friends Live.” was filmed and recorded live at The Millennium Forum, Derry in May 2014, just after completing their world tour the year be- fore. The High Kings has just now completed a 2019 tour of America and appeared at the Soiled Dove in Denver on March 21 and 22 to sold out audiences. In 2016 they performed in Huerfano County as part of the Spanish Peaks International Celtic Festival and generated great excitement because audiences can sing and dance along or simply listen. This screening is part of the Mercantile’s free movie night series so there is no admission. Donations to support this coming September’s Celtic MusicFestival will be enthusiastically accepted. For more information call the Mercantile at 719-742-3387. WALSENBURG — We’ll be tapping our Collaboration beer made at Blue Moon Brewery in Denver on Friday, April 19, 6 pm. Our new Head Brewer Erin McRad and a few ladies from the Pink Boots Society and Blue Moon, made Equal Hopportunity 2.0 a Pomegranate Key Lime IPA. The collaboration brew was made March 9 and will be making its way down to the Crafty Canary Brewery in Walsenburg for us all to enjoy on April 19, beginning at 6 pm until the keg runs out. Our bar manager Aubrey will be making up a crafty cocktail inspired by this beer. We’ll also have our usual amazing cocktails you have all fallen in love with. WALSENBURG — New Hope Community Church, 801 Pennsylvania, invites everyone to a sunrise service Easter morning, April 21, 6 am. There will be a brief outdoor service with a special musical guest artist followed by a free fellowship breakfast inside. LA VETA —Visit SPACe for the La Veta Schools Student Art Show. The show will be on display until April 20. LA VETA — La Veta/Cuchara Chamber of Commerce will have their monthly board meeting, Thursday, April 25, 8 am at the La Veta Schools Library, 126 East Garland Street. WALSENBURG — If you missed the first screening of “Neither Wolf Nor Dog” earlier this month, there is a second chance to see this record breaking film, Thursday, April 25, 7:30 pm at the Fox Theatre. The Fox has teamed up with the distributors of the record-breaking independent film, “Neither Wolf Nor Dog”, based on the award-winning novel by Kent Nerburn. WALSENBURG — The Walsenburg Eagles Ladies Auxiliary #1187 is having a meeting on Friday, April 26, 7:30 pm. At this meeting, nomination of officers will take place. Please plan on attending this important meeting. LA VETA — The La Veta/Cuchara Chamber of Commerce is sponsoring the Spanish Peaks Annual Job Fair at the Old School Gym at the La Veta Schools Saturday, April 27, 12 pm. We will be recruiting business owners and job resource centers to attend. We will also hold a resume workshop for job applicants. Email info@lavetacucharachamber.com for more information or to participate. WALSENBURG — EARTH an exhibition with over 50 Plein Air Artists Colorado (PAAC) members will open at the Museum of Friends on Saturday April 27. Please join us to celebrate Earth Day with a unique opportunity to see the work of artists from Colorado, New Mexico, Arizona and other locales as these artists share their love of painting outdoor with their spectacular works. Walsenburg will have a make- over as PAAC does a “paint out” of our town. PAAC was created for the love of Plein Air Painting and to enjoy the camaraderie of painting outdoors that creates opportunities to paint together while being open to everyone at every level. The museum opens at noon with Plein Air Painting demonstrations commencing at 1 until 3 pm. Join us at the Fox at 3:30 to see Loving Vincent an animation of the incredible Plein Air Paintings of Vincent van Gogh. Loving Vincent brings the paintings of Vincent van Gogh to life to tell his remarkable story. Every one of the 65,000 frames of the film is an oil-painting hand-painted by professional oil-painters (including a PAAC member) who traveled from all across Europe to the Loving Vincent studios in Poland and Greece to be a part of the production. After the film we are back at MOF for an open- ing celebration with light refreshments and music. The school tour program is available for kindergarten through high school with pre and post visit materials available for teachers interested in visiting with their students. Please visit: www.museumoffriends.org or stop in for more information or a card. Show your support of the Huerfano County Democratic Party by buying tickets. The Keynote speaker is newly elected Colorado Attorney General Phil Weiser. The upcoming 2020 election may be the most important election of our lives. Many offices are up for re-election including: President, Senate, and House of Representatives, and 2 county commissioners. We need to prepare for the 2020 election cycle! WALSENBURG — We’re planning a class reunion for the WHS class of 1969 on July 26th and 27th here in Walsenburg. At the present time, we are trying to contact classmates to get addresses, emails, etc.. Below are people to contact with ad- dresses: These people can be contacted via FB: Ben Trujillo, Larry Garbiso, Cathy Cordova (Tom), Theresa Martinez, Al- vina Valdez, Marlene Spengler (Vallejos), Theresa Martinez can also be contacted at tmartinez96@aol.com or 719-738- 1896…( messages). TRINIDAD — The Trinidad Autism Awareness Chapter will hold their monthly support group for families with a loved one with Autism, Sensory Processing Disorders, and Developmental Delay Thursday, April 11, 6 to 8 pm at the Trinidad Community Center, 1309 Beshoar Avenue. A complementary dinner is served sponsored by Shandy Clinic. There will be a presentation followed by round table discussion. TRINIDAD — Calling all youth between 14 and 24 years of age, Friday, April 12, 1 to 4 pm at the Trinidad Workforce Center, 140 N. Commercial Street, there will be a job fair especially for young folks. Please bring your resume and dress for success! For more information call 719-846-9221. TRINIDAD — Where will we pop up next? We will be at the Youth Club, 204 E. Kansas Ave, Friday, April 12, 6 to 8 pm. Celebrate Family Game Night, get your own library card, check out books and learn about Carnegie Library events and services. focus on self-care. We recommend bringing yoga mats, blankets and pillows from home to make the floor more comfort- able while we meditate. For more information call 719-680-3663. TRINIDAD — The Good Food Project Farm, 33812 St. Hwy 12 (Jensen), is having Spring Cleanup Days every Saturday in April, 8 am to 12 pm. Spring cleaning participants earn vouchers to use at the Farmers Market. Watch for the signs, mile marker 68. TRINIDAD — A variety of home baked goods will be on sale to support the Trinidad Autism Awareness Chapter Saturday, April 13, 9 am to 3 pm at Big R, 2208 Freedom Road. For more information call 719-439-8730. TRINIDAD — Relay for Life is sponsoring a board game night Saturday, April 13, 4 to 8 pm at Corradino Auto Body, 124 N Maple. Bring a potluck item to play games for free! If you’d just like to play games, donate $5 and you are in! Raffle tickets available for purchase for prize drawings. Coloring contest for kids. All proceeds go to the American Cancer Society. For more information call 719-680-0693. TRINIDAD — Alta Vista Alternatives, 415 S Indiana Ave. is hosting an Easter Egg hunt for any special needs child or teen plus the families and friends who love and care for them Saturday, April 13, 2 to 4 pm. There will be friends, food, and fun. Every child receives a prize basket. Enter to win a “Family Night in” prize package. For more info call 719-846-4400. TRINIDAD — The annual Elks Spring Craft Fair will be Saturday, April 13, 10 am to 3 pm at the Trinidad Elks Lodge, 120 S. Maple. We love hand made crafts and direct sales reps are welcome. Tables are $10 each. GULNARE —Spanish Peaks Inn is having their monthly breakfast buffet Sunday, April 14, 8 am to 12 pm. Come out for a breakfast feast for only $10. Spanish Peaks Inn also has Lent specials every Friday and don’t forget Taco Tuesdays! The Inn will also have Easter Dinner featuring ham, mashed potatos/gravy, veggie and roll for only $10. TRINIDAD — An Easter Egg hunt for ages 0 to 13, presented by Southern Colorado Family Center will be held Sunday, April 14, 1 to 5 pm at Los Ninos Field, Chestnut and Elm. 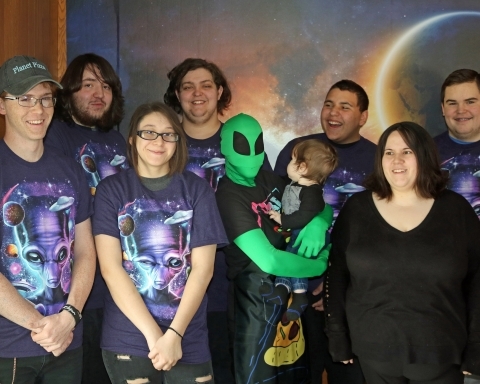 Illusional Dance Studio will be hosting Easter games, cake walk, games, and concessions. The Easter egg hunt begins at 3 pm. For more information call 719-251-6509. TRINIDAD — Beginning Monday, April 15, 1 pm the Carnegie Public Library has a new service. They have partnered with Health Solutions to offer this new service. Join us from 1- 4:30 pm every Monday to visit with a licensed social worker. She’ll be on site to connect you with resources, and answer questions. 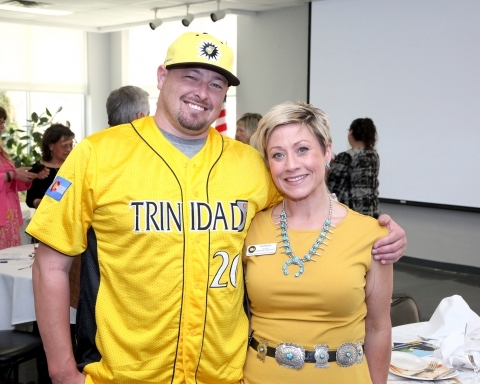 TRINIDAD — The City of Trinidad Tourism Board and Trinidad State Junior College have partnered to offer a free, half- day presentation for local businesses and individuals who interact with visitors to our community. Topics will include the importance of tourism to Trinidad, area festivals, museums, Old West architecture, the Highway of Legends, hiking and biking opportunities and other recreation opportunities. The free event is scheduled for Tuesday, April 23, 8 to 11:30 am in the Pioneer Room located in the Sullivan Center on the campus of Trinidad State Junior College. In order to plan for seating, please RSVP no later than 5 pm, Tuesday April 16 to either Marty Hackett (marty.hackett@trinidad.co.gov 719-846- 9512) or Donna Haddow (donna.haddow@trinidadstate.edu 719-846-5724). TRINIDAD — HuLA Early Childhood Council invites all parents with young children to our first Family Café, Tuesday, April 16, 6 to 8 pm at TSJC Adult Education Services, 600 Prospect Street. Enjoy supper, meet other families, make connections, and learn about resources. Childcare will be on site. Space is limited so call and registered at HuLA Early Child- hood Council, (719) 845-0463. TRINIDAD — Please join us for your chamber luncheon on Wed., April 17, 12 pm in the TSJC Pioneer Room. Our sponsor this month is Trinidad Triggers Baseball. Kim Schultz will bring us up to date on this season’s team, schedule, and events. Lunch is at noon is $12 per person. RSVP to lynn.schecter.tlacc@gmail.com or call 719-846-9285. TRINIDAD — Each month on the third Thursday, the Trini- dad History Museum, 120 S Chestnut St., hosts a heritage night focusing on different aspects of Colorado life. This month, Thursday, April 18, 5 to 7 pm learn all about “All Things Adobe”. Enjoy sweets, treats, and hands-on activities! These programs are geared towards adults, but all ages are welcome. TRINIDAD — You’re invited join us for a special Easter Get- Together Friday, April 19, 1 pm at Trinidad Inn Nursing Home, 409 Benedicta Ave. We’ll have an Easter Egg Hunt for the kids! TRINIDAD — A collaboration with Trinidad High School and Trinidad State Junior College presents The Scarlet Letter by Phyliss Nagy, adapted from the novel by Nathaniel Hawthorne at Southern Colorado Repertory Theatre, 131 W Main Street. Set in 17th century Boston, a Puritan settlement at the time, young Hester Prynne is led from the town prison with her infant daughter, Pearl, in her arms and the scarlet letter “A” on her breast. Rumors in the crowd mutter that Hester is being punished for adultery. This masterpiece examines the timeless truth that compassion and understanding are more powerful and enduring than vengeance and cruelty. Trinidad High School students comprise the Scarlet Letter Creative Team that is working with director Harriet Vaugeois to make this timeless piece relevant, entertaining, and thought- provoking for high school and college students, as well as other mature youth and all adults. TRINIDAD — This ride is part of the Explore Las Animas Dirt Series and will be held Saturday, April 20, 7 am to 5 pm. Ad- venture rides are not races. They’re about having fun hanging with like minded people who want to explore and ride hard. Rides are timed, but not for competitive purposes. Again, all roads are open and you must obey traffic laws. TRINIDAD — A Passover Seder will be held Saturday, April 20, 5 to 10 pm at Temple Aaron, 407 S Maple Street. Rabbi Jack Schlachter will officiate, and a meal will be provided by Alys Romer. Tickets are $36. To reserve your spot during early registration, please send a check to: Temple Aaron of Trinidad, C/O Randy Rubin, 228 S. 6th St, Raton, NM 87740. Please make sure to include your current address, phone # and email address for confirmation purposes. Thank you! Pre-registration and pre-screening will take place at Eck- hart Elementary School on Thursday, April 25, 8:30 am to 1 pm. Your child will be pre-screened by a kindergarten teacher. This process should take approximately 30 minutes. You must bring the following items with you: your child, completed registration packet, immunization record, and official birth certificate. If your child attends COG or Headstart, teachers will give parents the pre-registration packet by Monday, April 15. Registration packets will be available for children who do not attend COG or Headstart. Parents are welcome to come in to pick up a registration packet at Eckhart Elementary School. We are excited to have your child join us. Eckhart Eleme tary School is a “Leader in Me Lighthouse School”. Each day students learn and practice the 7 Habits of Highly Effective Students as staff work to develop the leader in each child. At the start of the new school year, parents still need to at- tend registration to receive their child’s teacher assignment and new school year information. Parents and children will be able to tour the building, keeping in mind that school is still in session. TRINIDAD — The second annual Corazon de Trinidad Poetry Festival will be held Thursday, April 25 through Saturday, April 27. Events include Open Mic, Poetry Out Loud, Readings and Book Signing, Writing Workshops, Adult and Youth Sessions, and more. The festival features: Alan Ainsworth, Molina Speaks, Juan Morales, and Maria Melendez Kelson. The festival will be held at: The Bloom Mansion at the Trinidad History Museum, 312 E Main St and Berg Little Theater at Trinidad State Junior College. Search: Corazon de Trinidad Poetry for more information. TRINIDAD — The Colorado State University extension office in Las Animas County is offering a small acreage workshop Saturday April 27, 9 am to 3:30 pm at the Leone Lounge on the campus of Trinidad State Junior College. There will be experts from agencies and organizations from across Southeast Colorado covering key ways to get the most from your slice of paradise. The morning workshop will look at wildfire mitigation to common health issues for horses to livestock. Following lunch will be a field visit where there will be an overview presented concerning your property, native and weedy plants, the establishment of pollinator plants, and a look at soil erosion mitigation. Register at smallacreageworkshop.eventbright.com. For more information call Lori Brown at 719-846-3681 extension 3122 or Kim Smart at 719-846-6881. TRINIDAD — The rumors are true! The Santa Fe Trail Festival is returning to downtown Trinidad on June 28th and 29th. Applications for Food and Non-Food Vendors are now available on the Chamber website. In addition to the applications, there is a Sponsorship Form for anyone wanting to help sponsor this year’s event. The Chamber website www.tlacchamber.org has the forms for downloading. Vendors make sure to download the Vendor Information with your Food or Non-Food Application. Completed applications may be mailed to or dropped off at the Chamber office, 136 W Main St., Trinidad CO 81082. If you have any questions please call Linda Barron 719.680.4498, or email lynn.schecter.tlacc@gmail.com. Thank you for continuing to support our community and local vendors. This is probably a VERY good time for Chamber Business members to check business listings on the Chamber website https://www.tlacchamber.org/business-dir. There many businesses that have not provided us with logo’s, company de- tailed information, website, or social media info. DES MOINES — This STEAM workshop, Friday, April 12 and Saturday, April 13 at the Mandala Center, 96 Mandala Rd @HWY 87, is an opportunity for middle & high school teachers to learn how STEAM: Science, Technology, Engineering, Arts, and Math program can benefit them and their students. For more information contact the Mandala Center, 575-278-3002 or visit the website www.madalacenter.org. DES MOINES — The Knights of Columbus will host a fish fry Friday, April 12, 3 pm at the Des Moines EMS Building, 77 N Olive Street. Great fish and fixings for $6 a plate. RATON — The opening reception of the Ralph R. Solano Memorial Exhibit will take place Friday, April 12, 5 to 7 pm at Old Pass Gallery, 145 S 1st Street. For more info call 575-445-2052. RATON — Hey folks! A call to action! We are having a volunteer work day Saturday, April 13 to build an obstacle course for our horses and program participants and redo some fencing for horses. We are looking for folks who aren’t afraid to work, sweat, and have a great time in the process. We can pro- vide a lunch and drinks to those that show up. Have a back hoe sitting around? Bring it on over. Tractor tire laying around? We need them! Blue Sky Ranch is located at the top of North 1st Street in Raton, then left on Fairview all the way to the end of the road. RATON — St. Patrick’s – St. Joseph’s Parish is holding the Knights of Columbus Coronado Council 1332 Pancake Break- fast Sunday, April 14, 7 am to 12 pm so COME HUNGRY! Proceeds benefit the Knights of Columbus “Ed Fidel Memorial Scholarship”. Join them on Sunday, April 14, at the St. Joseph’s – St Patrick’s Parish Hall serving from 7 am to Noon. Adult breakfasts are $6, Children 12 and under pay only $4. RATON — Several churches in Raton will be providing lunch- eons every day for Holy Week. Everyone is invited to these meals and devotionals. The location changes but all will begin at 12 noon. Come together as a community and remember this special week. Monday, April 15, – Calvary Baptist Church, 1345 Brilliant Street; Tuesday, April 16- 1st Presbyterian Church, 300 S. 3rd; Wednesday, April 17- Family Worship Center, 1501 S. 4th St.(at the Methodist Church); Thursday, April 18 – First United Methodist Church at 1501 S. 4th St.
DES MOINES — Come out Wednesday, April 17, 8 am to 11:30 am at Des Moines EMS Building, 77 N. Olive right behind the Old Firehouse for the Des Moines health fair. Other tests that do not require fasting are: Cholesterol Test, Thyroid and Prostate for men. Blood work is provided by UCGH of Clayton. Results will be mailed back to you. The staff at UCGH cannot answer any questions about test results. You will need to contact your doctor. Local EMS will perform these tests free of charge: Blood pressure, Pulse, ECG readings, Blood Sugar and Oxygen levels in the blood. Donations accepted for restocking. RATON — The Health Council meetings for April will be held as follows: the Substance Misuse Meeting Wednesday, April 17, 2 pm at CYFD in JPO meeting room. (Knock on back door); the Health Council Meeting Thursday, April 18, 11 am, at the CYFD Raton Conference Room. Recharging Our Community Economy workshop series ~ GrowRaton! RATON — Retreat House Quilters has about 14 members who have made quilts that will be on display along with other historical artifacts through the month of April at Raton Museum, 108 South Second Street. staff, computer needs, and promotional materials. 2019 through March 2020. Membership dues are $10. SPRINGER — Assessor’s Office Personnel will be available to answer your questions pertaining to Head of Family, Veteran’s, and Disabled Veteran’s Exemptions, 65 & Older/Disabled at any Age Valuation Freeze, Property Valuation Protest, Property Owner Account Information, and more Thursday, April 18, 10 am to 12 pm at Springer Senior Center, 504 Maxwell Ave.
RATON — Maundy Thursday Service at First United Methodist Church, 1501 S 4th St, in Raton April 18, 7 pm. Good Friday Service at Grace United Methodist Church, 7 Moody Ave, in Des Moines, April 19, 7 pm. Easter Service including the choir preforming an Easter Cantata at First United Methodist Church in Raton, April 21, 11 am. Easter Service at Grace United Methodist Church in Des Moines, April 21, 8 am with a breakfast potluck to follow. RATON — The Processional Walk will be held Friday, April 19, 6 to 8 am. We will start out at Fairmont Cemetery 6 to 6:30 am, pray for the departed and share a nice early morning walk to Mount Calvary Cemetery sharing fellowship and prayer of the rosary on this Good Friday. RATON — The annual Aqua Egg Hunt will be held Saturday, April 20, 11:30 am to 6 pm at the Raton Regional Aquatic Center. Admission is $5 per child regardless of age. Parents admission is FREE! Open Swim 11:30 Am – 6 PM. Pictures with Easter Bunny. Come dunk, dive, swim, splash for over 1000 eggs in the pool! This event is sponsored by Raton Elks Club. Contact Raton Parks and Rec by calling 575-445-4271. SPRINGER — The Knights of Columbus Easter Egg Hunt is set for Saturday, April 20, 10 am at Horseshoe Park. The hunt is for kids ages 2 to 10. Prizes will be awarded! RATON — The First Baptist Church of Raton, 225 S. 3rd St. will hold an Easter Egg Hunt Saturday, April 20, 2 pm. After the service, we will have a BBQ and an Easter egg hunt for the kiddos. 100th anniversary for Raton Public Service Co.
RATON — Come and celebrate the 100th anniversary of the Raton Public Service company. A reception will be held on Monday, April 22, 1 to 4 pm at Raton Convention Center. Refreshments will be served. Come register in person for a chance to win one of RVE $100 electric bill credits. Winning entries must have an active electric account listed on the entry form. Register for door prizes, sign up for power plant tours, and just come out and experience 100 years of electrical history. RATON — The annual Colfax County Health Fair will be Thursday, April 25, 9 am to 3 pm at the Raton Convention Center, 901 S 3rd. The health fair will include vendors, free and reduced-fee screenings, interactive exhibits, educational materials and resources, giveaways, and more! A special frozen treat will be given out in honor of Colfax County’s 150th anniversary! If you are interested in volunteering, would like more information on the event, or have a special needs request, please contact the Colfax County Extension Office at 575-445-8071 or colfax@nmsu.edu. RATON — We are looking for all kinds of “May Flowers” for the show to be hung on April 29. Old Pass Gallery will accept up to 5 pieces of artwork on Thursday, April 25 & Friday, April 26. All entries must be original works (painting, sculpture, mixed media, photography, jewelry and textile). There is a $10 entry fee per piece or $5 per piece if you are a current Artist member. For additional information or questions, director@ra- tonarts.org or call (575) 445-2052. Please join us in celebrating Raton’s Summer of Color! RATON — Do you need a Food Manager Certification to work in your restaurant or food business? Sign up for this LOCAL class to be held Thursday and Friday April 25 and 26 at The Center for Sustainable Community. Certification awarded when exam is successfully passed and is renewable every 5 years. The total cost of the class is $195. To sign up call the Center 575-245-9000 or call Florence 575-447-6474. RATON — Join Us for our annual fundraising event, Saturday, April 27, 5 to 8 pm at Raton Museum. This fundraiser is brought to you by Raton MainStreet and the admission is $15. The event includes beer and wine tasting featuring Noisy Water Winery, Blu Dragonfly Brewing, and Colfax Ale Cellar. There will be paired Hors d’ oeuvres and a silent auction. For additional information or questions, contact bferri@ratonmainstreet.org or call (575) 445-2052. PUEBLO — The 8th Annual Mental Health in the Sangres symposium will take place on Wednesday, May 15, 2019 at Pueblo Community College in the Fortino Ballroom from 8:00am-4:30pm. The purpose of this all day event is to destigmatize mental health and provide an affordable training opportunity for Southern Colorado professionals. This year’s symposium will be a series of educational presentations and panel discussions on mental health through the lifespan of a child, from early childhood issues to adolescent substance use. Attendees will receive a certificate for 6 hours of attendance. Early bird tickets are $40 and are available until May 3, 2019. The cost of the tickets will then go up to $50. Price of registration includes a boxed lunch. Corporate sponsorships are also available. For more information, please visit www.health.solutions or contact Dawn Yengich at 719-251-3971. PUEBLO — Build and plant your own windowsill herb gar- den in this fun, hands-on class offered by CSU Extension-Pueblo County. Growing, Using and Preserving Herbs will be presented on Tuesday, May 21, 2019 from 5:00-8:00 pm. or Wednesday, May 22, 2019 from 1:00-4:00 pm. Participants will learn to grow and care for herbs; flavor and food combinations; and how to dry and store herbs. Class fee $20.00 (includes planter). Registration is required by May 15th. To register, mail or bring payment (cash of checks payable to “Pueblo County Extension Program Fund” only) to CSU Extension, 701 Court Street, Suite C, Pueblo, 81003 or register by credit card online at http://Herbs_2019.eventbrite.com Call 583-6566 for more in- formation. Space is limited.